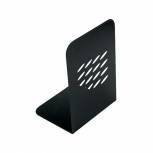 Q-Connect Magazine Rack Black CP073KFBLK Pack of 1 Q Magazine Rack manufactured from high impact polystyrene that will not crack or chip. Holds A4 files, paper and magazines neatly on shelves, desks etc. Colours match the Q-Connect Letter Trays. Colour - Black. 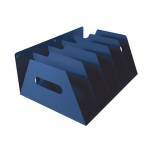 Q-Connect Magazine Rack Blue CP073KFBLU Pack of 1 Q Magazine Rack manufactured from high impact polystyrene that will not crack or chip. Holds A4 files, paper and magazines neatly on shelves, desks etc. Colours match the Q-Connect Letter Trays. Colour - Blue. 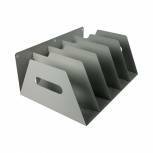 Rotadex Smoke White 5 Section Lever Arch Filing Rack LAR5 Pack of 1 Rigid and durable rack for housing lever arch files, directories, ring binders etc. Manufactured from Grey powder coated steel. Fixed dividing plates have rounded corners. Available in 5 lever arch capacities. 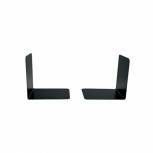 Q-Connect Metal Bookends (Pack of 2) KF03900 Pack of 1 Q-Connect L Shaped Metal Bookends. 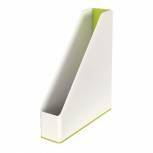 Quality bookends that support books and files on shelves, keeping them neat and tidy. Dimensions: W134 x H190mm. 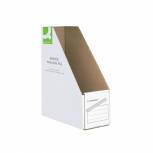 Q-Connect Business Magazine File W100xD230xH300mm White (Pack of 10) KF21659 Pack of 10 Q-Connect Business Magazine File 100x230x300mm KF21659 Large label area for easy identification of contents. Internal dimensions: W100 x D230 x H300mm. Avery Original Book Rack Black 66MLBLK Pack of 1 Avery Modular Bookrack. Features 6 high strength interlocking units that can be customised to make single or double compartments. H193 x W304 x D183mm. Black. 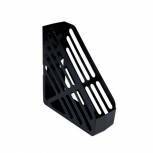 Avery DTR Eco Magazine Rack Black DR200BLK Pack of 1 Avery Desktop A4 Magazine Rack designed for stability and functionality. Angled base. Low front. Cut-out back and labelling area. Black. 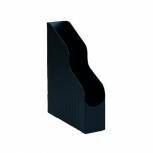 Rotadex Black 5 Section Lever Arch Filing Rack LAR5Black Pack of 1 Rotadex Lever Arch Filing Rack. 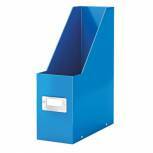 Rigid and durable rack for housing lever arch files, directories, binders etc. Manufactured from coated steel, dividers have rounded corners. Capacity - 5 files. Colour - Black. 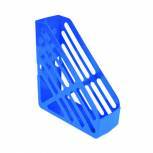 Rotadex Blue 5 Section Lever Arch Filing Rack LAR5Blue Pack of 1 Rotadex Lever Arch Filing Rack. 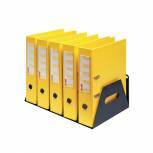 Rigid and durable rack for housing lever arch files, directories, binders etc. Manufactured from coated steel, dividers have rounded corners. Capacity - 5 files. Colour - Blue. Rotadex Gun Metal 5 Section Lever Arch Filing Rack LAR5GMETAL Pack of 1 Lever arch filing rack is a rigid and durable rack for housing up to five lever arch files, directories etc. Manufactured from powder coated steel. Fixed dividing plates have rounded corners. Can be wall mounted. Non slip rubber feet protect desktop. 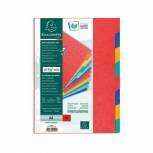 Exacompta Forever Magazine File Black 180014D Pack of 1 Manufactured from recycled fruit juice bottles. Suitable for A4 documents. Innovative shape for easy access to documents. Black. 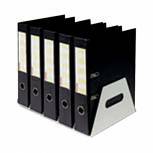 Leitz Click & Store Magazine File Black 60470095 Pack of 1 Magazine file with label holder for indexing on the back and front. Collapsible for space saving storage when not in use. Laminated surface for better, long-lasting protection. This contemporary design looks great in any office and at home. 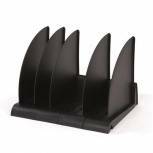 Avery DTR Eco Book Rack Black DR300BLK Pack of 1 Avery Desktop Book Rack. Sturdy, heavy-duty book rack with angled base to ensure books and files do not tip out. Solid dividers can be moved to form different sized compartment widths. Additional racks can be added. Colour - Black. 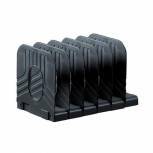 Avery Original Standard Magazine Rack Black 440SXBLK Pack of 1 Avery Magazine Rack 440SX. Plastic magazine rack in a stylish design. Suitable for storing A4 catalogues and magazines. H323 x W78 x D253mm. Black. 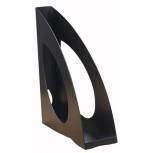 Metal Bookends Heavy Duty W140 x D140mm Black (Pack of 2) 0441102 Pack of 1 Heavy Duty Metal Bookends 140mm Black Pack of 2 0441102. Offer extra support for bulky items. W140 x H140mm.